With chaos descending on its retail stores at the launch of the iPhone 4S in China, Apple has introduced a new reservation ticketing system on its Hong Kong website to reduce the impact of scalpers claiming all available iPhone stock as soon as it arrives at stores. 9to5mac noticed the change, highlighting that Apple still offers its customers in Hong Kong two options to buy their new iPhone handset — with one taking visitors via Apple’s online store — but the other now directs users to a new reservation page that requires potential purchasers to enter their name, address, phone number and Government ID. Due to high demand, we are accepting a limited number of iPhone reservations per day. To request an iPhone reservation, please choose your store and the iPhone you want. If we have an iPhone reservation for you, you’ll receive a confirmation email by 9:00 p.m. tonight that includes the time when you can pick up your iPhone tomorrow. A government-issued photo ID matching the name and ID number on your reservation is required for iPhone purchases. If you don’t receive an email, we were unable to reserve an iPhone for you, and you can try again another time. Only those who receive an email confirming their reservation will be able to purchase an iPhone; we will not be selling iPhone 4 or iPhone 4S to walk-in customers. Note that is only affects customers that wish to pick up a device from an Apple Store in Hong Kong, not those who want to purchase it online and have it delivered once Apple receives stock. As we have noted before, Chinese scalpers have been utilising bespoke applications that allow users to tap into Apple’s ordering process and secure devices before the public gets a chance to order. It appears that this was also being done with Apple’s reservation system, which booked reservations on a first-come-first-served basis. 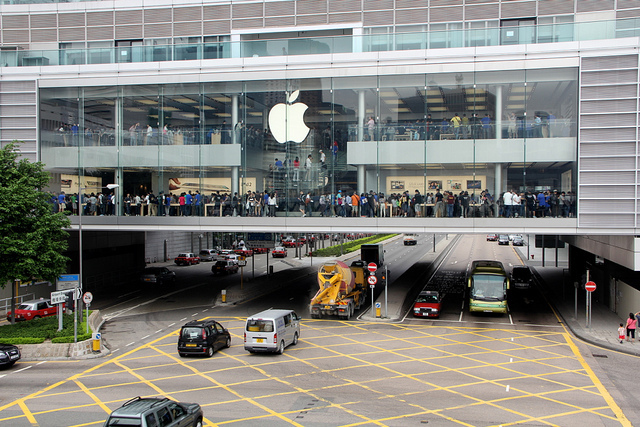 Now, customers have the chance to reserve an iPhone between 9am and 12pm. If they are lucky, they will be notified by email before 9pm, providing them with a time to pick up their device the following day. The new process gives Apple a chance to vet orders before issuing reservation slots to customers, reducing the impact that scalpers could have on potential sales. We can’t help but suggest that Apple utilises a similar process to ensure valid customers can order devices at launch but this can help drive demand when supply is low. Apple has to play a careful game in reducing the problems it faced at its Chinese iPhone 4S launch, this is a slow but sure step towards making it fair for anyone.